start this project in a way he wanted to create something different in a short time (less than a month). Design and architecture are really well done using a perfect mix of architecture, texturing and squaling in a 'non flat' small town. There isn't a lot to explore but attention has been put to surrounding detail, houses, church(include cemetary) and even the lighting. Its tiny but nearly perfect . 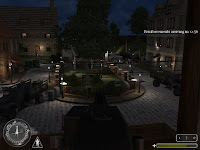 Gameplay is also well handled: fighting through the town with you squad produce a lot of triggered ambushes that will cause a lot of suprise and from each direction. Objective are simple and easy to execute. 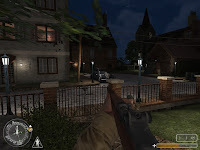 You won't walk for miles in this towns and fight won't take ages to complete, but challenge is defenetly present with all the enemies respawn that will occur.